At Olson's Lawnscape we provide our customers in Escanaba, Marquette, Gladstone, Iron Mountain, and Menominee Michigan with the assurance that their pet control problems will be handled in the safest, most effective way and done in a professional manner. 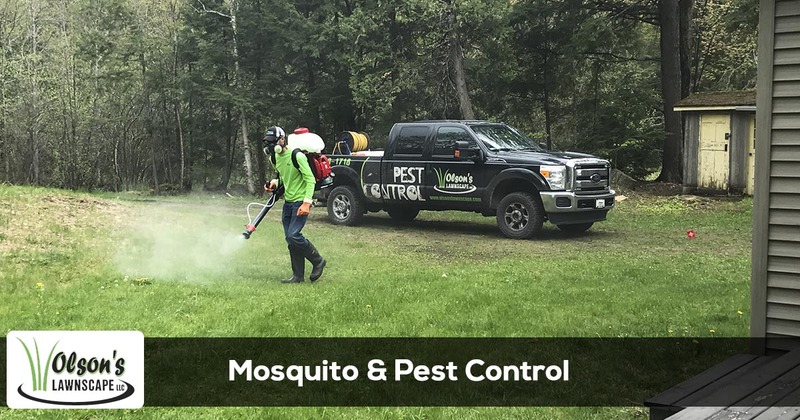 Olson's Landscape is a licensed exterior pest and mosquito control company by the State Of Michigan, so you can count on professional results with every service. Call 906-399-1718 today to get started. Owning a property and enjoying its benefits are a pride and a privilege Escanaba homeowners don’t take for granted. They all know that all those tranquil and peaceful summer days spent outside and all those fun and thrilling summer night parties don’t come for nothing. It takes work, passion and effort to keep your own green environment clean, healthy and thriving. Of course, one cannot enjoy anything if their yard, garden and landscape are infested by pests and mosquitoes. Besides being really damaging to the vegetation and soil, many pests pose a threat to people, children and pets as well. Mosquitoes are terribly annoying and pests in general also come with diseases and larger environmental threats. What Are Olson’s Lawnscape Certified Pest Control Services? Our pest control programs are certified by the Michigan Department of Agriculture and implemented by licensed workers using only safe and custom-made products and substances. Many companies use cheap and common insecticides which can severely impact the soil and the vegetation while damaging edible crops and endangering beneficial insects in the process. If you notice a pest problem on your lawn and landscape, give us a call! Our experts will first conduct an investigation and an overall assessment of the problem to identify the pests and the seriousness of the situation. We apply pest control treatments that are certified, tailored and efficient and we do regular follow-ups to make sure the nasty critters haven’t returned. We can implement such programs as one-time pest solutions or we can design you an annual pest control program so you can make sure your landscape is protected and you don’t have anything to worry about no matter the season. What Else Can Olson’s Lawnscape Certified Pest Control Services Cover? Besides our time-honored lawn and landscape pest control programs, we can also offer our customers home pest control and commercial pest control services. Most pests keep their dirty deeds within the borders of your lawn and garden, but many will want to break into your home, posing a threat to your home’s structure and your health. If you notice the signs of any insect infestation in your house, don’t hesitate to give us a call or ask for a free estimate. Our certified inspectors will come down your house and assess the situation. Depending on the findings, we will design you a pest control program which includes both intervention and follow-ups. For a thriving company, a lush and inviting outdoor landscape is a good business card. But besides dealing with a mosquito here and there or with some spring grubs that aren’t hard to deter, businesses deal with more pressing pest matters that need to be handled quickly and efficiently. The food preparation industry, retail, and service providers need to be wary of pests as much as they can. In fact, for companies that deal with food (restaurants / cafes, grocery stores, bakeries etc) it is imperative to benefit from regular pest control check-ups and safe pest control programs implemented all year long. Don’t let any creepy crawler ruin your property, house or business! Call us today and have our specialists come up with a fail-proof pest control program for your own needs! Take advantage of our risk-free policy and pay us nothing in case you are not happy with the results!